With holidays fast approaching, the UX Studio at IHG sought to broadcast some holiday cheer and thank our fellow teammates for a wonderful year. But how, and what form should it take? 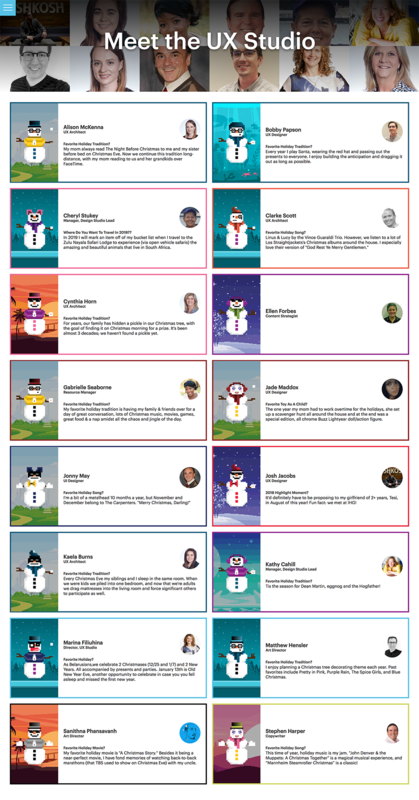 We designed, built, and marketed a snowperson builder, which allowed users the ability to create a snowperson with more than 3 billion different permutations. At IHG, we put a high value on fun. I an internal list of our teams’ core values, our department head specifically asked that fun be moved from the #8 slot to #1. We channel this heart into all of our experiences big and small; in addition to being functional and fluid, they should also have personality. I’ll walk through how we focused this enthralling, future forward approach and thinking on our 2018 IHG UX Holiday Experience. On the 26th of November 2018, the UX Studio Manager challenged us to conceptualize a holiday card to distribute to our direct partners as well as the company as a whole. However, as we began to consider our target audience and the what was expected of us as a group, the idea of a card quickly grew into the idea of an experience. Our team was able to refine, ideate, design and build, in house, and extensively test this experience in a meager three weeks time. Working through development speed bumps, tight deadlines, and with a necessitated cohesion of copywriting, design and development, we were able to pull off an experience that exceeded our goals of being a fun, user-driven holiday extravaganza. · The product should convey a sense of teamwork, gratitude, unity, and fun first, and promote the UX Studio second. · Users should walk away from the experience with a sort of takeaway that could be shared and potentially revisited. With these core goals established, we could begin pursuing concepts. An animated video, an interactive story, and even a customizable holiday madlib all came out of early discussions. Our third party resource quoted us a build time that would’ve extended past the actual holidays, and so our final product was limited to what our team could create using whatever tools we were experienced with at the time.